I used to frequent Ward and Patch, a sporting goods store on Annette just east of Jane. 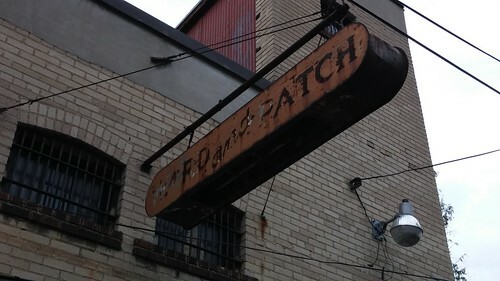 It closed a few years ago, and is now a hardware store, but in the back alley you can still find an old Ward and Patch sign. What a coincidence you found this at this time. Patch Adams and the Children's Ward comes to mind. When I lived in T.O. I used to bike there a lot especially in the spring & summer when I was playing baseball in early 70's. I became involved with Bolton Baseball Exec. as equipment mgr. & decided to make a change from previous supplier to Ward & Patch. The 1st time I walked in I saw somebody I recognized 30 years earlier. I said I remember you from 30 years ago. He said his name was Aaron. We struck a good working relationship for the next 2-3 years until they closed & they moved to Mississauga with another sports store. Spent alot of Bolton Braves $ there for equipment & supplies over those years & always was giving freebies to our association. The stock requirements just outgrew the size of the store.